As the seasons pass, we’ve moved beyond the apples and pumpkins. Peppermint has had its day. Now, ready to step into the spotlight, is the succulent pear. 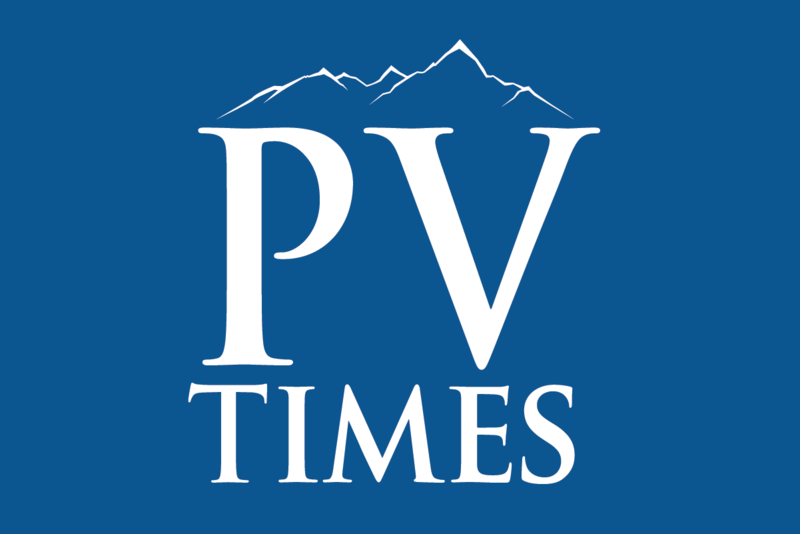 Patti Diamond/Special to the Pahrump Valley Times Except for Bartlett pears, nearly every other pear is in peak season through January and February. They are perfect for this dessert, a crostata, a rustic, freeform Italian tart similar to a pie. Except for Bartlett pears, nearly every other pear is in peak season through January and February. This includes Green Anjou, Red Anjou, Bosc, Comice and Asian pears. It’s a bounty of mouthwatering options. You can’t depend on color to know if a pear is ripe, especially with winter pears, as color remains the same into ripeness. To see if a pear is ripe, apply gentle thumb pressure to the base of the stem. If it gives slightly, it’s ripe. If you purchase unripe pears, place them in a paper bag at room temperature and give them the thumb test daily. When ripe, refrigerate them if you don’t plan to eat them right away. Personally, I don’t mind an over-ripe pear. I like it when you have to eat them over the sink because the juice runs down your neck and up to your elbows. Perfection! In this recipe, I used red and green Anjou pears. Their smooth skin and firm, creamy flesh makes them perfect for baking or poaching as they hold their shape nicely. Similar to a pie, crostata is a rustic, freeform Italian tart. Other names would be a galette if you’re feeling French or rustic tart if you’re not feeling fancy pants. A crostata (I’m feeling Italian today) cooks faster than a pie and can be sliced while warm. But a warning; it’s going to leak. But that’s ok, just use parchment to ease cleanup. Preheat oven to 400°F. To make vanilla sugar; place the sugar in a large bowl. Sprinkle the vanilla over the sugar and whisk to thoroughly combine. Add the brown sugar, flour and salt, then whisk. Toss the pears with the lemon juice, then toss with the sugar mixture. On a piece of parchment; roll out the dough to form a 12-inch circle. Spoon pear mixture onto center of crust, leaving 2 inches from edge of dough. Gently fold the edges up and around the pears, pleating to make a circle. Brush the dough with milk and sprinkle with sugar. 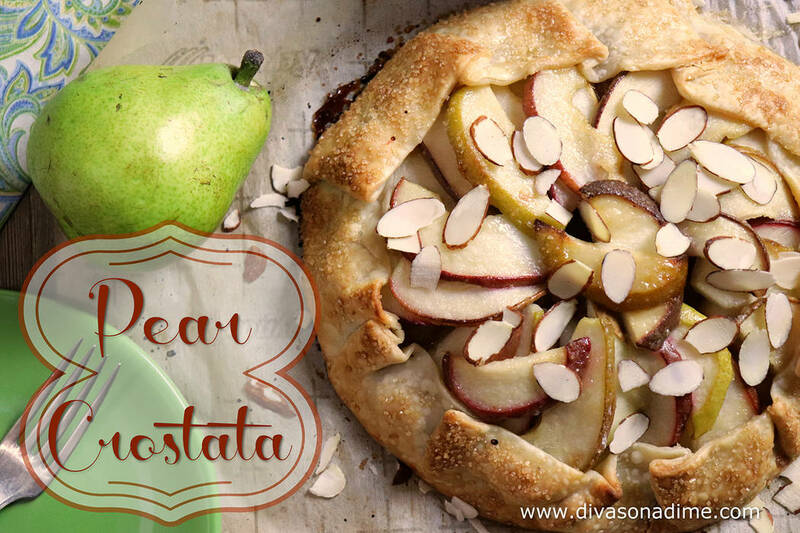 Lifting the parchment, lay the crostata on a baking sheet with sides. Bake for 30-40 minutes until the crust is golden and the pears are tender, you’ll want to watch closely in the last 10 minutes. Sprinkle almonds over pear mixture during last 5 minutes of bake time. Serve warm or at room temperature. Frugal and Fabulous Food by Patti Diamond from “Divas On A Dime – Where Frugal, Meets Fabulous!” – www.divasonadime.com Join the conversation on Facebook at DivasOnADimeDotCom.